Although governments of 193 countries had promised way back in 2015 to end tuberculosis (TB) by 2030, the global annual rate of TB decline since then has been much less than what is required. 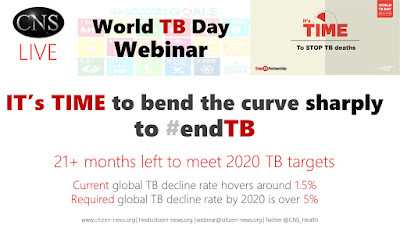 The rate of TB decline which is currently hovering around 1.5%, should catapult to over 10% by 2025 globally (and 5% by 2020), in order to end TB by 2030. It’s high time to end TB! Around World TB Day 2019, let us listen to senior veterans who have helped shape the fight against TB - world's leading infectious disease killer. Join us in the online dialogue! Dr Mario Raviglione, who headed the Global TB Programme at the World Health Organization (WHO) till November 2017, has invested almost two decades in strengthening TB response globally. Dr Kuldeep Singh Sachdeva, heads the national TB programme in India, which has the highest TB burden, and has been instrumental in improving TB programme outcomes in the past several years. Prabha Mahesh, a TB survivor, leads by example, in empowering people dealing with TB, with hope and dignity. 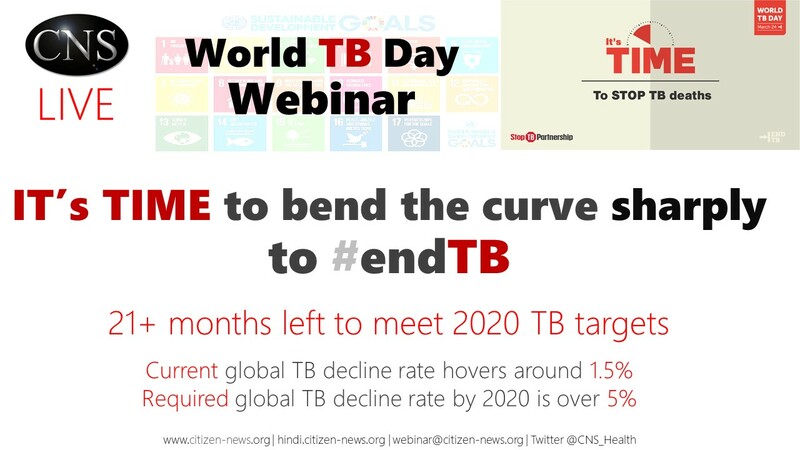 This #WorldTBday Webinar was LIVE streamed on Facebook and YouTube.